Charles Choubersky was an avid inventor and very interesting character. His inventions brought him worldwide fame, but he committed suicide in 1891. 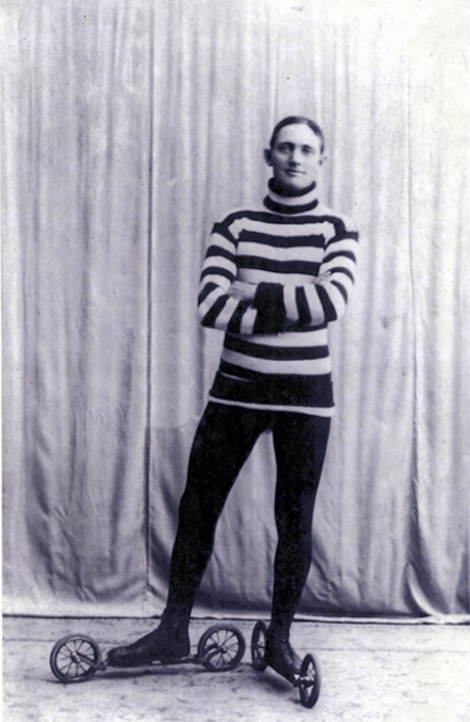 Though these road skates – and his name – are well-known over a century later because of the famous poster (above), very few of the actual skates are still in existence. C de Chouberksy was a famous French inventor. 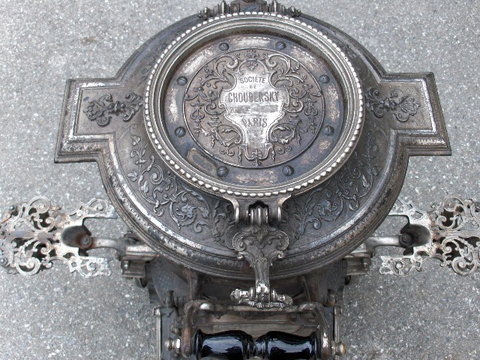 Though there are not so many of his skates still around in the 21st century, his ornate woodstoves can still be found. Charles Choubersky was a communications engineer, well-known railways specialist and inventor. Born 1835 in Tula, where his father, also a well-known railway engineer, was at that time in charge of the arms factory he had built there. C. began to manifest an ability for invention at an early age, and at 10 was interested in the problem of perpetual motion. For this reason his father, having first sent him to the Imperial St Petersburg Lyceum, transferred him to the Institute of the Corps of Communications Engineers. Having passed the entrance examination with third highest mark in 1851, C was top of the class throughout his 4 years at the Institute, and when he graduated in 1855 with the rank of lieutenant, was honoured on a marble plaque. While still at the Institute he invented a new method for designing bridges, which he published in the Communications Journal in 1855. Because of this, as soon as he graduated he was sent by the Director of Communications and Public Buildings on a trip abroad to study the construction of railways, especially on steep slopes, and also the, manufacture of locomotives. It was during this trip that there first occurred to him the idea for the “Makhovoz” device, which he was later to put into practise, although unfortunately with limited success. While diligently observing and studying all the notable foreign railway equipment, C did not forget the manufacture of locomotives and carriages, and whenever he came across something of interest he spared neither time nor trouble in acquainting himself with every detail of its manufacture. For example, he did not hesitate to take employment as an ordinary fitter at the Maggei locomotive factory in Munich, where he worked until he was adept at all the techniques involved. 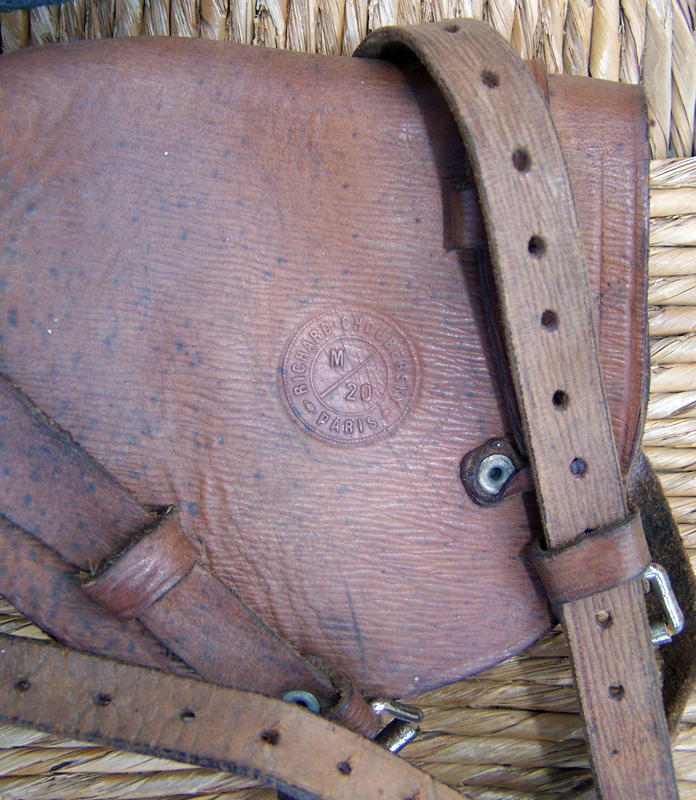 On returning from abroad, C was entrusted with making a survey of the Warsaw railway from Warsaw to the Prussian border. He then surveyed the Oryol-Gryozi, Azov and Rostov-Vladikavkaz lines. While engaged on this work, he saw for himself the heavy costs occasioned by hilly country) and, trying to find a remedy for this, C started to develop his “Makhovoz”, which consisted of a system of flywheels and was first described by C in the Communications Journal in 1860. 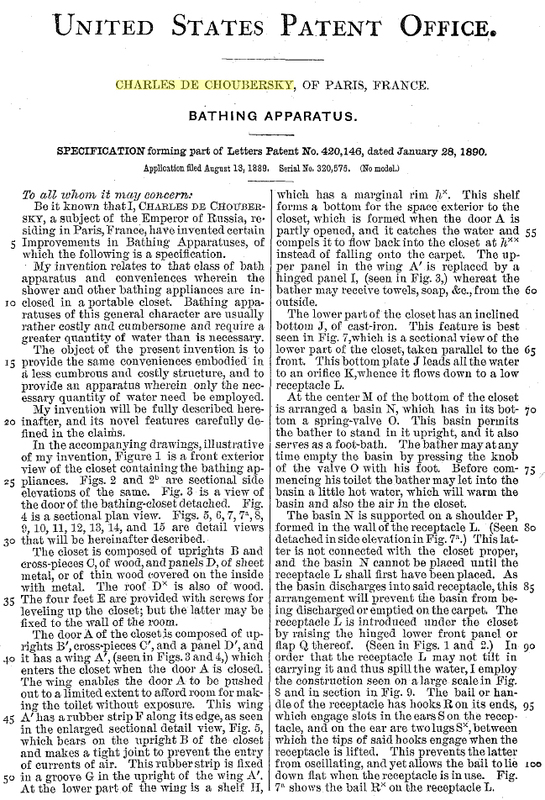 The article sparked off a violent debate, and C’s invention was criticised by several noted engineers. However, when C published a description of the machine in a separate book, in 1862, a number of well-known engineers came to his defence. But when the time came to pass from theoretical discussion to experiment, the opponents of the “Makhovoz” were proved right, and the invention did not justify the hopes which had been placed upon it. This was the result of insufficiently careful design, rather than of any inherent fault in the idea, which was put into practise many years ago in the shape of the so called Russian Mountains *,hence the French name for them, “Montaigne Russe” literally Russian Mountain , which are constructed in Petersburg for the Shrovetide celebrations and are popular abroad. In the mid 1860’s, when the construction of, the OryolGryazi and Voronezh-Rostov railways was nearing completion, rolling stock needed to be built for them; C was amongst those enlisted to help in this task. Here for the first time he was able to apply the knowledge he had acquired at the Maggei factory in Munich. His creative talent had its fullest expression during the building and equipping of the narrow gauge Livny line from Verkhovye to Livny. Appointed a member of the Board in charge of building this line in 1870, under A.P. Bobrinsky, later Minister of Communications, C brought a number of his own inventions into use on the line, such as a special size coupling system, a new type of 1,650 kg goods wagon capable of carrying a load of 5,000 kg, special lubrication boxes, a new buffer system, special sleeping cars etc. In the early 1870’s the Ministry of Communications decided, in view of the quickening development of the railways, to establish a special technical department, which would be in charge of building rolling stock for our railways. It would, naturally, have been hard to find a more suitable head for such a department than C, and he was offered the post. The offer coincided with the death of C’s father, who left him a fairly sizeable inheritance. He therefore did not take up the excellent offer, preferring to go abroad and set up a special company for developing his projects. Living first in Vienna, then in Brussels, and then in Paris, C made a number of different inventions. 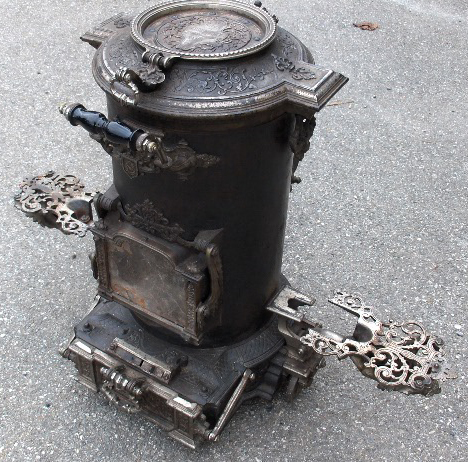 The invention of a portable stove, which became known as the Choubersky stove, brought him wide publicity and vast profit. These stoves earned their inventor several hundred thousands every year. C built himself a large workshop in Paris, with a special section for inventions, and spent much time and money on various experiments, which sometimes cost him tens of thousands of francs. In general, money only existed for him insofar as it could be spent. Each year he spent up to 100,000 francs on advertising his inventions by way of articles, notices, pictures and verses in the illustrated papers. He had three fine shops of his own in Paris, in which his inventions were sold, and shortly before his death he built a fourth on the Boulevard Montmartre, notable for its elegance and beauty. All the details, bronzes, fireplaces were designed by well-known artists and architects, including Gamier, architect of the new Paris Opera. 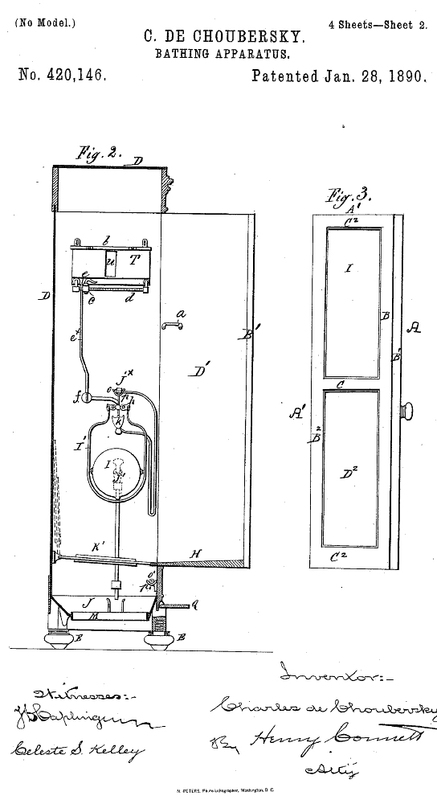 The last of C’s inventions was the “armoire-lavabo”, which became widespread in Paris after his death. ‘Two features of the new invention were found particularly valuable: the small dimensions and the modest expenditure of water. During his last years, C for the most part concentrated on perfecting the most simple objects, after stating his belief that great inventions are usually of less benefit than the improvement of everyday objects. C’s inventions brought him worldwide fame. He was particularly popular in Paris, so much so that in the panorama of his contemporaries, the “Histoire du Siecle” 1789-1889, put out in Paris for the International Exhibition of 1889, he was included in the list of contemporary Parisian celebrities. However neither popularity nor material comfort satisfied C, and he appeared’ unhappy with life often, especially in the last years of’ his life. This explains his suicide. C shot himself in Paris in November 1891. He was 57. Andrew Peck and Irving Snyder started the Peck & Snyder Sporting Goods company in 1866, located at 124-128 Nassau Street in New York. 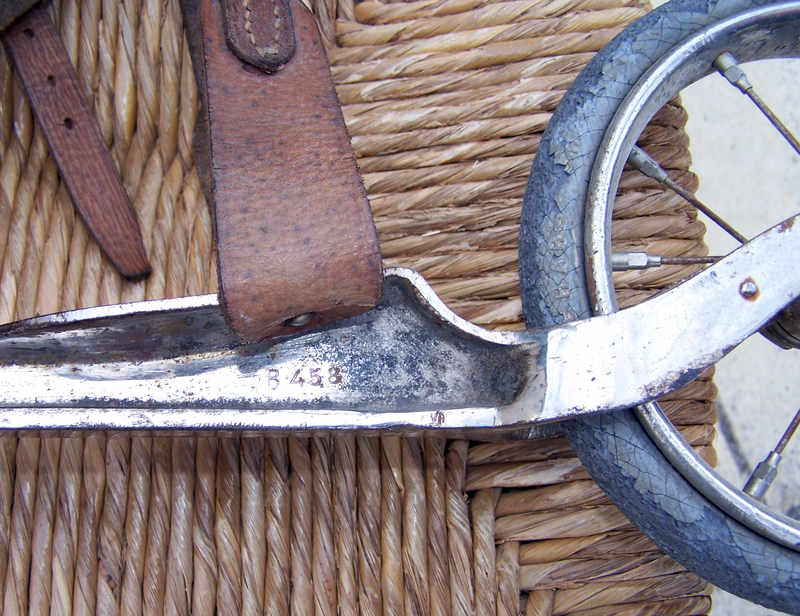 They found early success with their invention of the first rubber-soled and canvas tennis shoe, as well as patenting their design for a two wheeled inline skate in 1900. In order to promote baseball to a worldwide audience, Irving Snyder joined Chicago sporting goods owner and ex-baseball pitcher A.G. Spalding on a world tour in 1888. According to biographer Mark Lamster in his book “Spalding’s World Tour,” Irving had a secondary motive for the trip. He wanted to find an international buyer for thirty thousand pairs of roller-skates. They went to Australia, Egypt, England, France, Hawaii, Italy, and New Zealand. Several prominent baseball players of the time accompanied them. Snyder and Spalding’s trip was designed to introduce baseball to a global market. 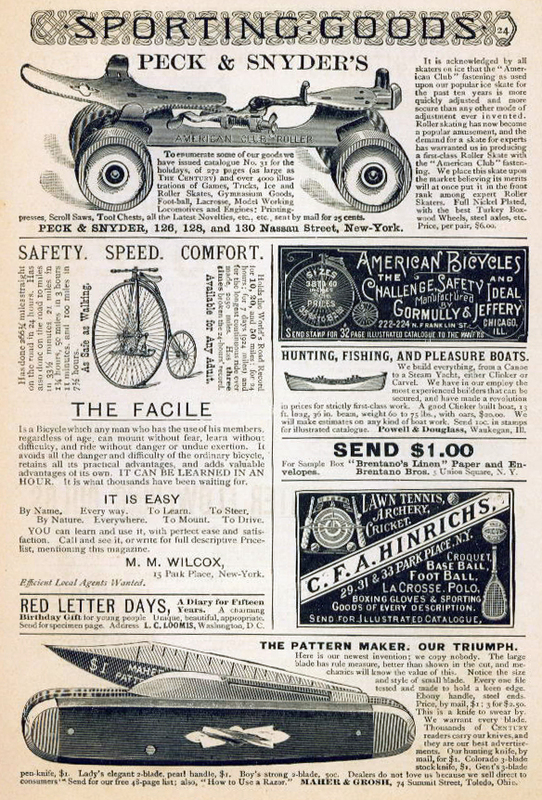 Six years after their return from the world tour, A.G. Spalding expanded his Chicago based sporting goods store by purchasing Peck & Snyder Sporting Goods. 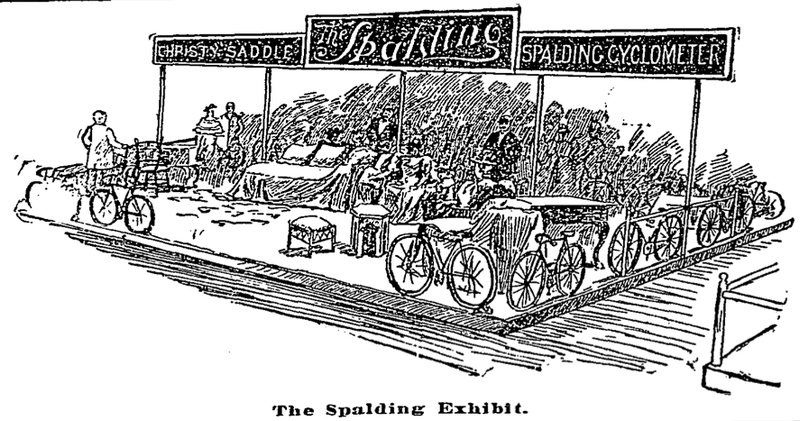 Spalding was a major bicycle retailer, supplying bicycles to the American military in the 1890s and marketing the famous Christy saddle.